Another week, another kitchen update! Since we started re-building the kitchen with ceiling planks and beams, even through a major flu bug, we have been gleaming with excitement. Demo is no joke! TV shows make it look quick and easy, for us, it was tiring and felt like it was dragging on forever. So after demo was done, any progress in the building process was good progress! But this past week, it was GREAT progress! Here are some of the views of our space exactly a week ago today. 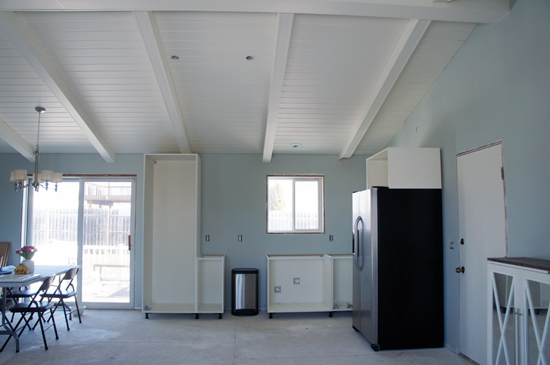 After the beams were in, we had to wait for inspection to be done prior to fixing the sheetrock. That was done Tuesday morning, and woohoo, we passed! 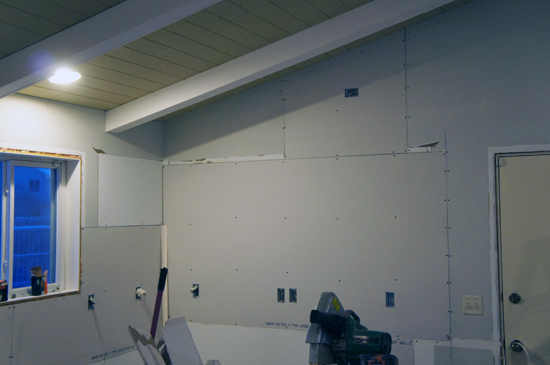 You better believe that sheetrock started going in on Tuesday evening! My husband grew up helping his father with drywall, and with his guidance, the walls were well on their way to being finished within a few days... Our other task for the week was caulking all of the seams in the ceiling. I blog for a lot of reasons. I love looking back at the evolution of our home and projects as well as the social interaction blogging brings, however, we also share our mistakes and lessons learned in hopes of helping others down the line. 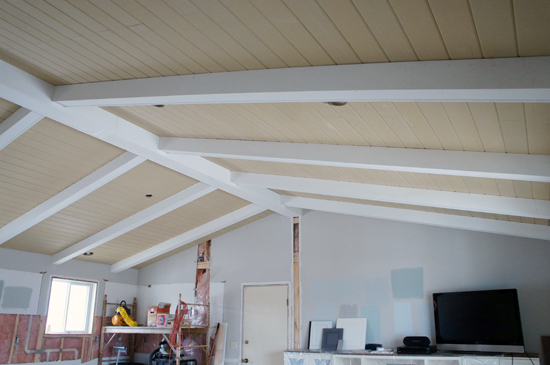 We have made a few mistakes in terms of this renovation, and one was beam and plank placement. When we started the project, we planned to space our beams four feet apart, knowing we had support running up in the trusses every two feet. When we had the electrical pulled during demo, to reduce the number of trips being made by our electrician, we also had all of our ceiling lights measured out and installed. Prior to planking, we started out by measuring and marking our beam lines every four feet from the edge of the far wall. We did this so we could end our planks under beams, preventing any seams from being visible. After we were 3/4 of the way through planking, we realized that where we planned on placing our beams would come super close or completely cross paths with three of our ceiling lights. We could not figure out how we missed that earlier, with all of the planning and measuring. So we had two choices, move the lighting, or move the beams. Because the beams hadn't been installed, we decided to move the beams. With that, we had a few spots on the ceiling with seams in the planks where they met end to end. Lesson learned, those seams can be hidden by beams if you hash things out correctly before starting. In cold Wisconsin, we experience a small amount of expansion and contraction with woodwork. We researched a few patching options, and opted to go with paintable caulk, which allows for some flexibility. 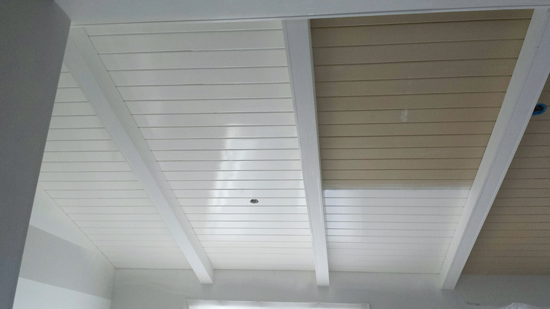 We caulked every nail hole, seam and all of the planks to give us a really pretty seamless look. So even though we had a little mishap, the caulk did a beautiful good job in hiding those unexpected exposed seams. 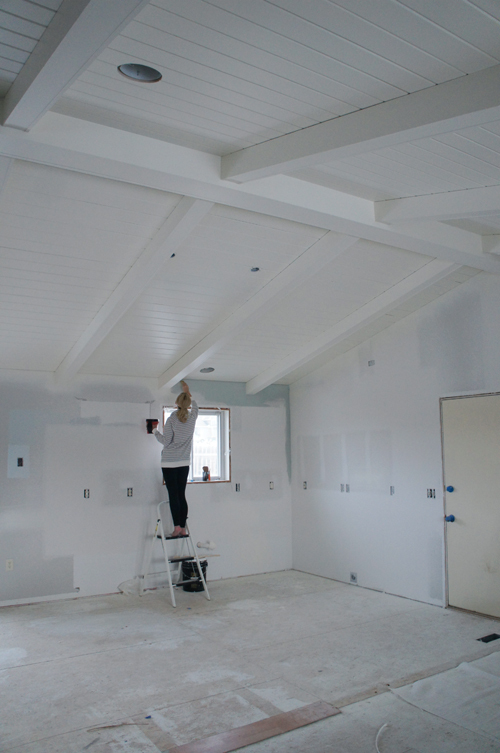 By Saturday morning, the ceilings were ready to be sprayed! Me: "Honey bug, we are a blog, we have to spray our own ceiling!" Bryan: "I am not so sure. I think we should hire it out." Me: "No way, it will be expensive, I know we can do it!" Bryan: "Let me convince you otherwise." And he did. 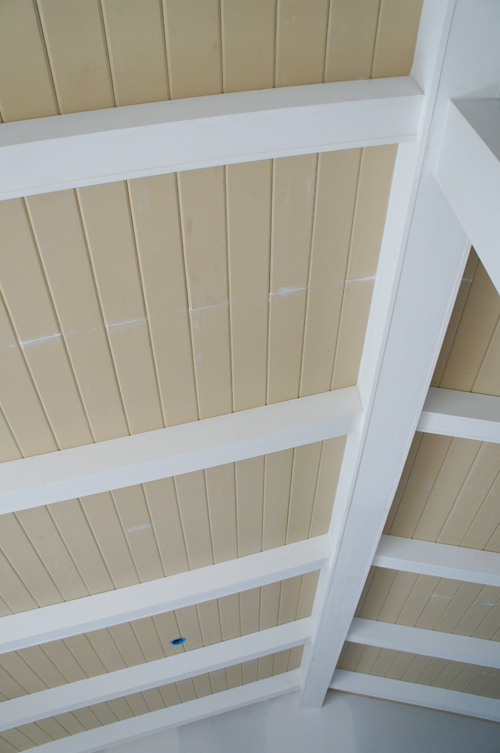 We were quoted $200 by a local painter to have our ceiling sprayed, if we supplied the paint. After evaluating the options of purchasing a paint sprayer or renting a paint sprayer and doing it ourselves, never using a paint sprayer before and potentially creating drips and blotches, $200 sounded like the better option. And it was for us. We left Saturday morning at 9:00, and after receiving a text of the progress, we were already really excited to get home and see how well the paint was covering. We went with Benjamin Moore's Simply White in an eggshell finish. It was a really close match to the IKEA white cabinets we are installing. This is the point at which I was also super relieved that we spent a little more for primed boards. Coverage was amazing. 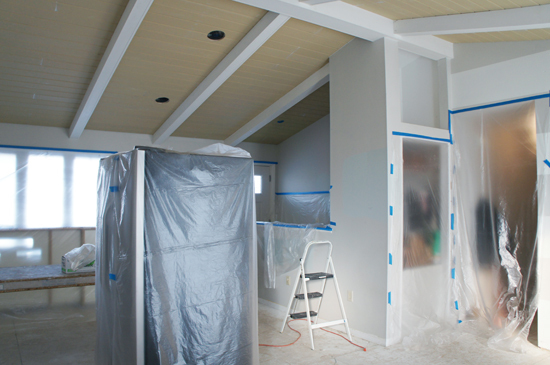 And when we returned home after the second coat was applied, I ripped that painter's poly off like a band-aid. And I didn't scream in pain, I squealed with delight! I mean you guys, the ceiling is GORGEOUS! No photo can do it justice, I am madly in love with our glorious white beamed ceiling! Now, let's talk paint... Not only was the ceiling ready for paint, so were our walls. It was time for me to settle on a color once and for all, and just get it done. The problem I was having is that all of my swatches looked different on different walls at different times of the day. If l loved a swatch on one wall, I didn't like it on another. That happened for every single color I tested. So I realized that I just needed to make a decision and get something on all of the walls. After most of the gray | green | blue colors were not jiving with my vision, I tried to resort to a simple gray. My sweet husband voted no. 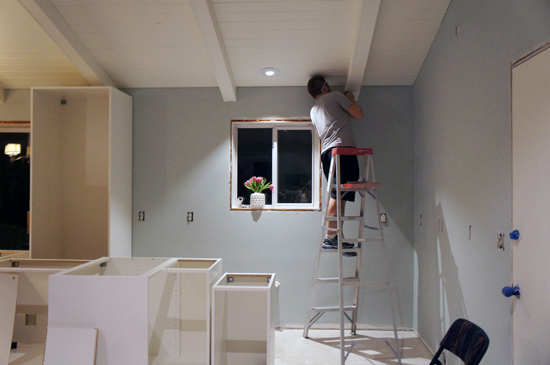 He wanted some sort of color on the walls, and felt I was using the gray as a cop-out. I was happy he cared enough to challenge me, but what the heck? So, after 1,089 Google image searches, 324 hours of looking at swatches on the walls and in the paint store, and 17 opinions from friends and family, I went with Benjamin Moore's Quiet Moments. We are a colorful family and we do need color on our walls. I don't want the space to become too trendy or modern or sterile, so I went back to the grey | green | blue scheme that I had been toying with for the past four weeks. I started painting Saturday afternoon and found a little helper along the way... any guesses who that may have been? And if I thought colors looked different on different walls... boy was I in for a surprise with this one. It looks different on different walls, and throughout the course of a day from morning to evening. Sometimes it reads really gray, while other times it is a pretty minty green. I sort of love it, I sort of hate it. Ha! So, in terms of the color, it may change before this entire renovation is over. But I also know not to judge a color just yet. There have been a few times when I have painted a room and wondered if I made the right choice, only to fall head over heels in love with the color once everything else was in place. Fingers are crossed that is what happens with this project, but if not, it is just paint. And in the spirit of picking and sharing colors (finally! ), here are a few more selections I am toying with at the moment. We have white cabinets going in around the back wall of the kitchen (see more here), while we are planning on doing a dark gray island. The blacksplash I am leaning toward is the marble herringbone, although, I really love the patterned blue option, so I am trying to find a way to work that into our home somewhere. The counter will be a neutral stone, and then of course some splashes of color through floral fabric on a roman over the window and nearby throw pillows. I also scored a vintage chandelier on Craigslist for over our dining table, more on that in a future post. I am hoping that the combo of some of the old and new, whites and woods, soft tones and bright accents, will be the perfect balance of a family friendly room that doesn't feel too serious or boring. While I painted, Bryan started assembling cabinets! Aside from the island, all of the cabinets have arrived and now we are hoping we don't run into any problems with missing pieces. More finger crossing happening now. Ready for mistake number two? A little over a year ago our original refrigerator died a long and painful death, and knowing a kitchen update was in our future, we felt OK purchasing a new side by side option. We scored a great deal and thought we were going to be high-fiving ourselves for the early purchase. Little did we know that in order to really maximize our kitchen and island layout, we would need a counter depth fridge. A counter depth fridge is not standard, you actually have to seek them out. We did not purchase a counter depth fridge. Sigh.... So, our current fridge will either be sold on Craigslist, or replace our freezer chest in the garage because we avoid that deep hole of frozen food like the plague. Otherwise, so far, so good! Our cabinets are really tall, which I LOVE. We are actually gaining storage from this renovation, and tall cabinets are part of that awesomeness. They are so tall, that we had to use an oscillating tool to slice a small piece of our new beams. But once the cabinets are installed, one would never know. And see how the colors on the wall keep changing? Crazy town. Also, my DSLR has been away being repaired for weeks now, so my little point and shoot has some crazy auto-coloring happening. All that said, here is what the space was looking like as of this morning. All day today I just kept walking up stairs and standing in the middle of the big, empty area. There are no words for the feelings of joy that flow through my veins by the second. The ceilings feel so tall and grand. And now that the walls and ceilings are painted, not only does it feel bigger, it finally feels like one meant-to-be cohesive space. Oh no! That makes me a little nervous, sorry to hear that Lora! We actually already ordered one, and it is waiting in our garage all wrapped up. I had read a lot of reviews in search of storage, storage, storage (probably no surprise given my love of organizing), so I hope that it works out. We really did not want to have to swap out the fridge, but given code and the amount of space we need between the fridge and the island, it was something were didn't have a lot of wiggle room with. Have you considered recessing the fridge into the wall? I've seen that done before, so that the full fridge appears to be counter depth, since it sits farther back than the cabinets (in between studs). It is an exterior (garage wall) with electrical and insulation behind it. Unfortunately it would not be a viable option to recess into the wall cavity. Thanks for the tip though! That ceiling is gorgeous! I grew up in a house with vaulted planked ceilings. I love them. Speaking of love....that couch and fabric!! Where can I find them? wow, what an amazing transformation already! cannot wait till it is finished. Looks amazing! How close are you to the MN border? 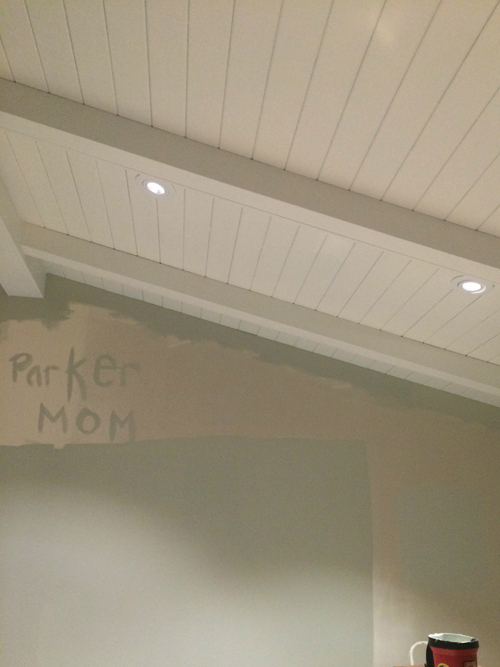 If it's a distance that a painter might travel, would you be willing to share the name of the one that did your ceiling? Thanks! The painter is about 40 minutes, so I am not sure if he would travel, but if you email me, I can get you his phone number. :) xoxo! Oh. My. I love love lovety love your ceiling. It's amazing. I want to buy a new house to do a ceiling like that. The height is emphasized and feels so open, light, and airy. Nicely done! And I hear you on the ever changing paint colors. My boy's room is like that...one color (no matter the color) reads as about 7 different ones depending on the wall and time of day. It's pretty amazing really. I agree! I have been a bit fascinated watching it throughout the day. I would keep in mind with the herring bone tile, that it is really in right now. However in a few year it might not be. So ask yourself if you love it because it's the style or if you really love it. Tile backsplash isn't as easily changed as paint. Also the place is looking amazing, congrats and great job. Hi Amber! I agree, having lived with backsplash that I didn't like for about 8 years, I have been much more picky with selections this time around. But the herringbone has been on my wishlist for over two years, so hopefully I still love it for many more. And I have to say, it is pretty gorgeous against the walls. I am wanting something visually interesting and a little different, but something that should remain fairly neutral and classic at the same time. Nothing is set in stone yet though! Oh my goodness, this is looking incredible! So excited to see the end result! Wow! The project is coming along beautifully. I have kitchen-envy. You are right about the color though - in some of the photos it looks really blue and in others it looks very green. I have never seen a color that changes so much with the light. Can't wait to see photos when everything is done. I love the way the space is looking. I look forward to all of your kitchen posts. I can't wait to see the finished space. Looking great i cant wait for the reveal! Wowee, looks amazing! Love watching what you guys do with your spaces and how you take mistakes in your stride (I'm sure it doesn't feel that way at the time but you're problem solvers so it sure looks that way!). I love the colour because I know you will make it work. It's so much harder when you have to cover multiple areas but it's just neutral enough to be versatile :) Super job, gold star!!!!! I came here to comment about the counter depth fridge and I found out someone beat me to it! I have to say, I totally agree with her. I hate mine, too. It is SO small that I struggle with it with just my husband and I. It is a ONE person fridge. The drawers are ridiculously small; you can't even open the drawers wide enough to put in a head of iceberg lettuce. I have a Samsung, by the way, and it is three years old. Maybe they've gotten better, but ugh. You'll need that other big side-by-side in the garage! I don't know if you ordered a side-by-side fridge or a French door w/freezer on bottom. We have a counter depth French door w/bottom freezer and LOVE it! I love the wider doors to fit in larger items, and also like that left-overs don't get, ahem, "lost" in the back of the fridge, haha. It took a bit to get used to the bottom freezer, but it has a couple of bins to help with organization. We are a family of 6 and can fit A LOT of food in our fridge/freezer. Agree with Heart and Haven ... LOVE our French door/bottom freezer counter depth refrigerator. Requires organization, but leftovers are used and not "lost", focuses our shopping lists, and looks wonderful in our IKEA kitchen. Those bulky refrigerators are way too big for a streamlined contemporary kitchen. I couldn't agree more with anonymous and Heart and Haven. The bulky fridge on your recent photos eats up the whole room. I may have missed it in the post, but have you considered having it white or colored (I have a dislike for metal-resembling plastic). We are purchasing a counter depth, which will be completely enclosed with only the doors visible. We actually can not keep the deeper fridge without completely modifying our entire plan and reducing the size of our island (code states that we need three feet between the island and exterior cabinets/fridge). We decided a little less fridge space is worth the gain in the island. They give off a beautiful soft white light (not yellow, wahoo! ), and should last quite awhile being that they are LED. The ceiling looks amazing! Love love love! Love the color on the walls! Even just from these few pictures of it its easy to see that it can turn into a ton of different colors easy enough - which could be a curse and a blessing!! The grey would be meh, but the mint-er version of it is so nice!! The ceiling looks great! What kind of counters are you looking at? Thank you! Right now we are leaning towards Silestone, but we have a little more research to do before deciding for sure. Love what you have done so far. I was wondering if you could tell the source of the patterned blue tile. I love it! Looking absolutely amazing!!! We also had to buy a counter depth fridge because the other one would stick out too far. I love the new ceiling! It's gorgeous! I also love the paint color. I think it's fresh and playful, fitting for a family. :) About the fridge... I think I would actually prefer a counter depth fridge for 2 reasons. 1) I simply don't like the look of regular fridges, they are just too bulky. 2) I grew up in Germany where fridges are generally speaking a whole lot smaller but yet it always worked out. We rarely had food go to waste. With our big fridge here in the US now, food always seems to end up in the back of the fridge and is usually forgotten about until it goes bad. Anyways, I hope it'll work out for you! If anyone can make it work, it's probably you as you are always very creative and organized with the space you have available! ;) Good luck! Oops! Usually do run a spell check but completely missed it today. Must have been too excited about the progress. :) Thanks for the reminder! I admire all the work you guys are doing. Can you please come to my house next? I really like the wall color! Paint can be so tricky but at least from the photos, it seems like a great gray/green/blue that will look fresh and updated but not trendy. Kitchens are a long hard renovation, I know from personal experience! I was 6-8 months pregnant with our first child when we redid ours, ha. 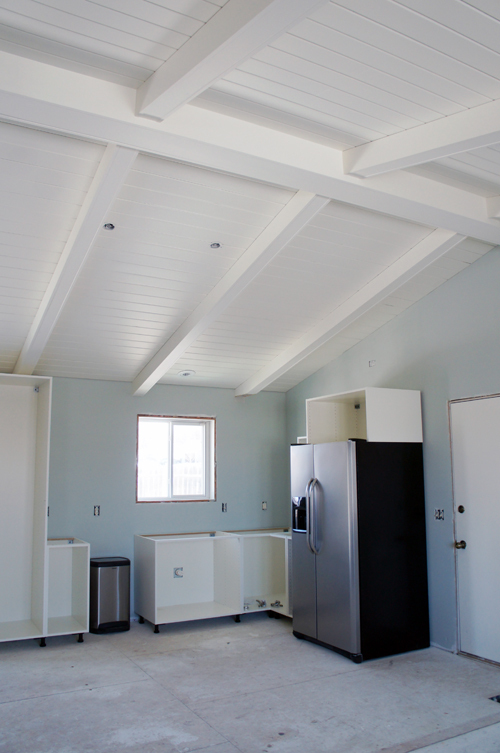 Yours is off to such a great start, love the white planked ceilings!! What a difference a coat of paint makes! I especially love your beautiful ceiling - it looks amazing now it's been painted! 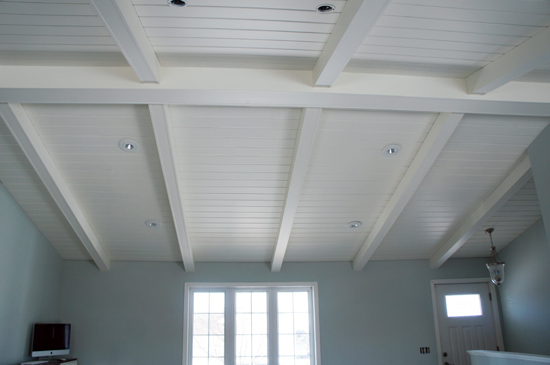 Your ceiling looks amazing and I believe it does wonders to your space! I like your plan with white and gray cabinets and the herringbone tiles. I´m getting so kitchen envy! It might be difficult to find the right counter to go with that tile, though. It needs to be exactly the same or really different so they complement each other. Would you mind sharing your favorite choices? What comes to fridges, here in Finland fridges are normally counter depth and nowadays people prefer fridges which have similar doors as the rest of the kitchen, so you really can´t tell where the fridge is! And there is really so much space in these counter depth fridges, you can reach the things in the back too ;). So now worries, it´s going to work out just fine! Beautiful! I'm loving following along with the progress. Keep up the great work! The ceiling is mesmerizing!! So far everything looks great. I cannot wait for next week's post. I recently moved into a home where we needed a counter depth fridge for proper clearance in the kitchen. I was really nervous about buying one because I love to cook and have two young sons, therefore I always have an incredibly full fridge! After using mine for several months I absolutely love it!! It is so much easier to see everything in the fridge and food doesn't get lost in the back. We are wasting less food and I love the streamlined look it gives my kitchen. I do have a second regular depth fridge in the garage though and it is super helpful for extra gallons of milk or larger items. With thee boys I don't think you would regret keeping your current fridge instead of the freezer. Good luck with your remodel. It is turning out beautifully so far! This is great to hear, thank you Christy! I was starting to get nervous! Glad to hear that you are enjoying the counter depth option. :) Thank you for chiming in with your experience! Jen I am DYING to see the finished product! I love a renovation!!! You're doing an amazing job and your selections are fabulous!!! Good luck with everything! You guys are amazing. I love everything about what you've done here. I love the ceilings. So happy for you. Your space looks wonderful! looks so great! I forget - what are you doing with your floors? Love it! I also wanted to say that we also have a counter-depth fridge and I love it! It looks built-in, takes up so little floor space and, honestly, the difference in storage space has been hardly noticeable to me. I'm sure it will be fine for you, too. Sorry if I missed it but are you installing the flooring before cabinets?? Hi Lizzy! The type of flooring we are installing should not be installed first, as the weight of the cabinets and island could potentially cause buckling. So they will go in once all of the cabinets are in place. :) xo! Looks great!! I'm jealous! I've never done a kitchen reno of my own so I'm sure there's a logical reason for this but why start assembling the cabinets and moving furniture back in before the floors are installed? I would have thought after painting that would be the next step. Can't wait to see your next kitchen post! Hi Valerie! We thought so at first also, but after researching things, the type of flooring we are installing needs to be done after cabinets. The weight of the cabinets and island could potentially cause buckling. So they will go in once all of the cabinets are in place. :) xo! Wahoo! So exciting! I have Quiet Moments in my bathroom and I LOVE IT. Yes, it feels like different colors all of the time, but I think that they are so pretty. It also looks very clean in unnatural light, where as some of the other colors in my house look very yellow and brownish and sterile (I have Revere Pewter and Moonshine on a lot of the walls). And yet another reason I love QM is because it looks so rich and pigmented, if you get what I mean. If you decide to go with another color, I love Gray Cashmere (trick- it's not gray) by Ben Moore. I have it in my dining room and it pretty much stays the same minty-blue soft color, no matter the light (for me). Good luck on all of the decisions! I know how stressful they are, but I always tell myself "It's just knobs! It's just paint! I can change it!" Looks SO good!! $200 to hire it out was definitely worth it! All I can say is WOW! That is a TON of progress for just one week! It looks SO good! I can't wait to see what you chose for cabinets. We head to IKEA next week to (hopefully) pick ours out. How has the assembly process been for them so far? I also must add- it is so adorable that through all the chaos of renovations, you have a vase of flowers sitting on your folding make shift dining room table right in the middle of construction, now THAT shows the meaning of "happy moments"! I'm in love with how the wall color looks near the deck door with all the natural light! Way to go, you guys should be very proud of how much you've accomplished! Its going to be a gorgeous space! So far, assembly has been pretty good. The first cabinet was a learning process, but by the third or fourth, we were tossing the directions to the side because they are all the same essentially. For a DIY'er, these kitchens are great and save money, but they do require a little extra work (OK, a lot, but it's not awful). I love it! I have a few rooms that change color too, but I kind of love that. I love that the sun makes my dining room look more green, but soft light makes it more blue. And then at Christmas time with all the lights, every color is warmer. I find that if I love a color, just go with it. I tend to over think these things, but lately I have been finding if I love a paint color, then most likely I will like it in my home too. What are the floors going to be? It will most likely look different with flooring in too. Hi Jessica! We are doing a floating floor, you can see them at the bottom of this post here: http://iheartorganizing.blogspot.com/2015/01/iheart-kitchen-reno-lets-do-this.html. The ceiling looks amazing! Great choice going with the painters. I have no doubts that you could have done it on your own but sometimes it's nice to just come home and see something completed. The wall color is beautiful too! I love that it seems to change shades so much. I'm definitely writing down that color name for future reference. THIS LOOKS AMAZING! I'm so excited for you guys!!! And you're making me ache for my own kitchen reno!! My sister updated her fridge for a counter depth fridge a few months ago and she loves her. It's a bottom freezer option with french doors and she seems to have plenty of space. They also do have another fridge in the basement in lieu of a freezer, so maybe keeping this one is a good option for your family, too. I'm glad you're waiting before changing the color. I would cringe at minty green walls as well, but the photos read a really soft blue, so I'm curious what it looks like in person. I can't wait to see what it looks like when it's all pulled together! I am absolutely smitten with this. Gorgeous!!! 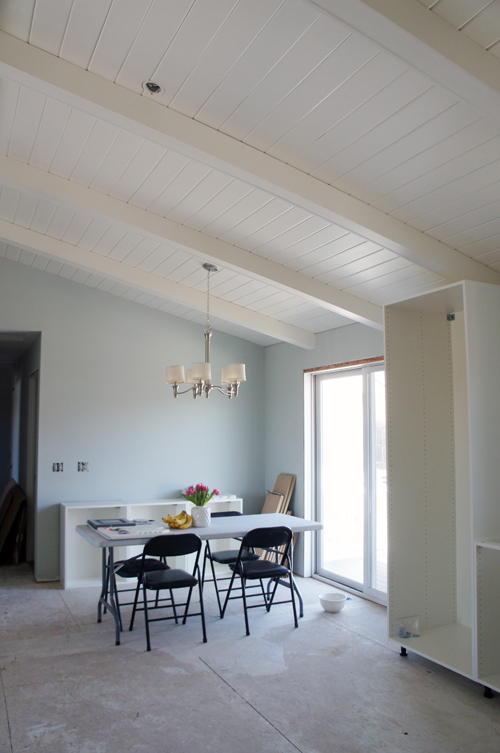 I think that color is gorgeous with the white ceiling and cabinets. I tend to go safe with white and light gray walls, but that color is just so happy! We have a counter depth fridge (and 4 and 5 year old boys) and I love it. I really don't miss our full sized one at all. It's easy to keep organized and has nice deep drawers for bread and produce. We actually just got rid of the spare fridge in our garage because we didn't need it! The ceiling being painted makes SUCH a difference - looks gorgeous!! I love that you share what you learn from your mistakes - it really helps the reader. I would say - definitely keep the second fridge! At least for awhile, until you can determine if you are struggling with the smaller fridge. I am a newer reader, and am learning so much from your blog :) Thank you for sharing and letting us read along!! Just wondering why you decided to do eggshell for the finish on the ceiling? 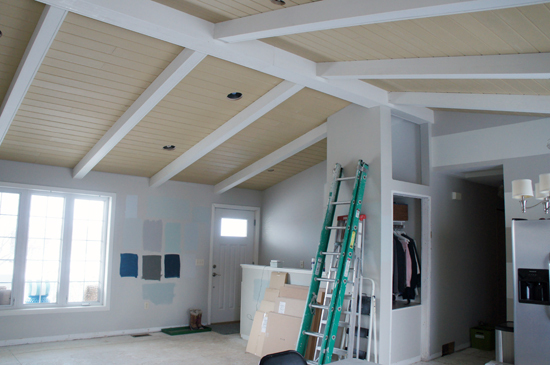 I love it but I thought I always understood that you want to do a flat finish on ceilings. After looking at yours it does look like it helps to bounce more light around though, which would be a huge bonus. And good call hiring out the spraying. Totally worth $200! Great question! 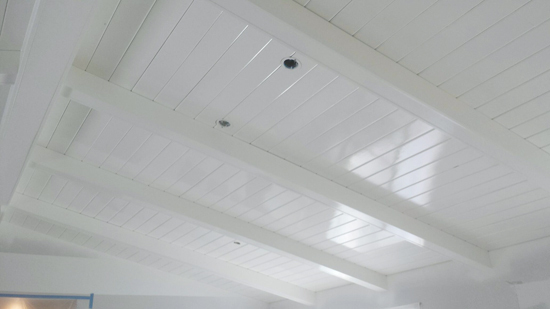 Regular ceilings are typically done with a flat finish, which I personally love. 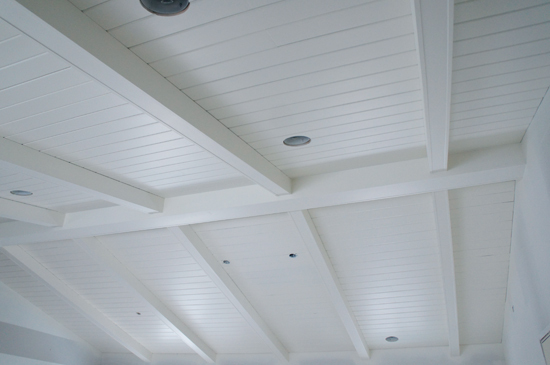 But I have seen planked/beamed ceilings done in just about any sheen, I think it just depends on the end effect you are going for. 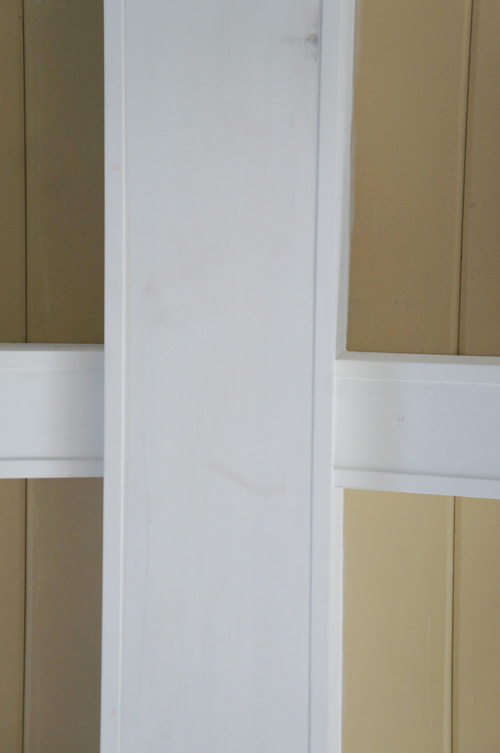 For us, with the expense of the paint we were purchasing, we picked a sheen we knew we could also use on our trim and doors, because we weren't sure if we would have extra (and we did) and didn't want to waste it. So the decision came from wanting to be able to use it for other parts of the room, without going too shiny with the sheen (since eggshell is just a step up from flat). It seemed like a good compromise and I really love how it turned out! Keep your old fridge, you will want it, just not sure how convenient it will be going to the garage especially in winter. Living with a counter depth fridge is frustrating, too small. We replaced.ours with a standard depth sidebyside and are so much happier. Its tough when you are limited in space. You do what you can. It is looking good though. Also, if the changing color really bothers you, think a neutral gray would work better. Love Sherwin Williams Amazing Gray. Provides a nice.contrast with white, but you might want to cut it at 30-50% if you want it to be on the lighter side instead of medium. The fridge is an investment, so it is understandably an important decision. I think for a large family (and the boys are going to start growing fast soon. Teenage boys eat a lot, I heard:) a large fridge is a must. We have two regular depth fridges for a family of six, and I can't imagine cutting down on the fridge storage. Function over form! Gah! we have the same color in our open-living-room-kitchen-dining area! Its crazy how different it looks all the time. You said it so well, ...sort of love it, sort of hate it! Its such a beautiful color, but in the open area i find it very challenging to work with as far as accessories, (especially curtains) but that's just me - you are very good at all that stuff so i can picture you making it shine! My husband loves it, and every time i am looking at paint swatches for the whole space he gives me "that look" :-) i love watching your progress - thanks for sharing!! We also had to switch to a counter depth fridge when we remodeled the kitchen in our old house. We sold a year ago and I miss it terribly! Things don't get "lost" in the deep depths like in a standard fridge. Our new house has a side by side which I do not like at all. I LOVE the herringbone back splash. Just wondering: when you caulk nail holes and paint over on trim or anything really, can you still see the nail head and/or caulk in areas? We just had our trim installed and painted and this is the case with ours. I was really hoping for a smooth/seamless/even look and that is not the case. The painter made me feel like that was impossible and even said you can't have trim without nails. I understand that but don't want to see them. Am I being too picky/unrealistic? You may see a small amount of pitting when the caulk dries in the nail hole, but the caulk is wiped clean with a sponge and should not remain on the trim. We find caulk is easier to work with than wood filler, and prefer the small amount of flexibility it offers. 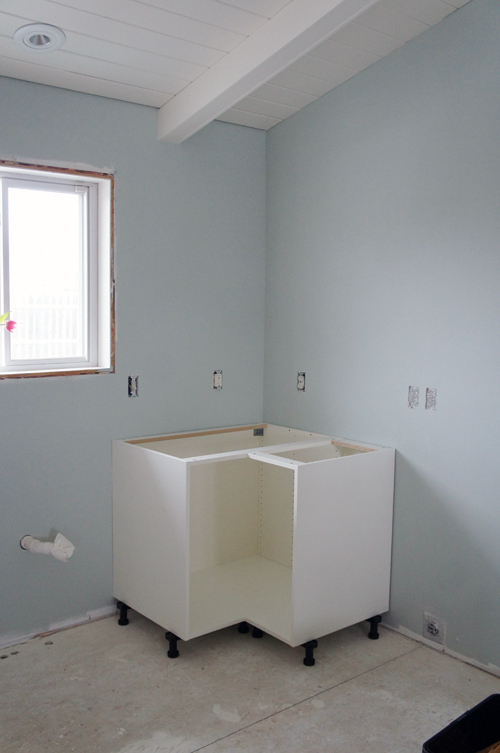 To be really sure there are no pits, the hole could be caulked twice (which we did not do). It also may depend on the quality of paint. I found that any small nail marks that were visible before painting, completely went away after the ceiling was sprayed. Two coats of a higher quality paint self leveled really nicely for a seamless look. This looks awesome. I love the chandelier; we have one very similar that I installed in our dining room shortly after we moved and it makes me happy every time I look at it. It's like jewelry. I gotta be honest, I love the new paint color. 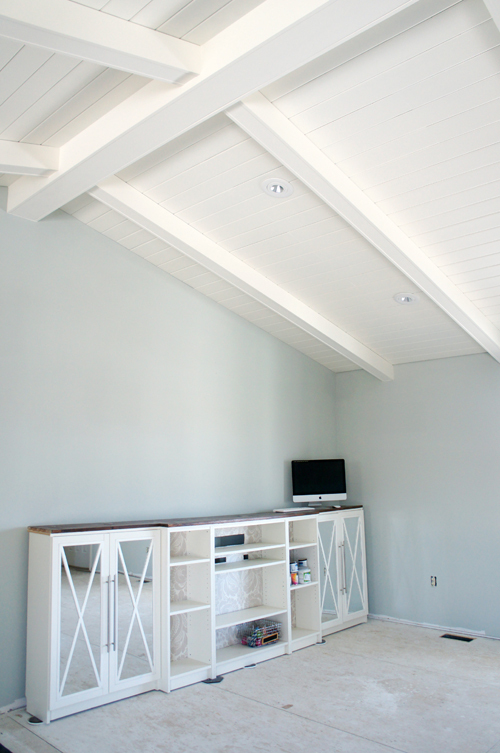 I may be biased because our dining room is painted a very similar color (Olympic Alpine Shadow). I just took a look at your house tour and honestly I was not a fan of the gray walls. This gives a nice subtle touch of color. I think your navy curtains are really going to pop against the new color (unless you decide to change those out in that case, I am very willing to take them off your hands...first dibs here please?). What a great idea. I can't wait to see the finished room. I love the tall ceilings with beams. Hope to find that in our next house when we move next year! LOVE the progress!! I must say, have you ever thought of carrying over the beautiful wainscoting that you installed in your stairway into the living room and wall where the cabinets for the boys backpacks and such used to be? Might add that extra classic look that you are working towards. You guys did such a good job on it in your entryway and stairwell. Just a thought :) xo! Thank you for the suggestion Stefani! We have toyed with the idea of bringing in more decorative moulding throughout - but haven't decided either way yet. I think we will have a better idea of what we want to do once we get the outer cabinets installed. :) xo! Seems like the color is just right for your family! That fabric you chose is beautiful, and along with all your other lovely finishes it will look fabulous! great job so far! I have to tell you you're bringing back memories; we did a kitchen remodel 11 months ago. The wall color you picked is very, very similar to mine. I love it. :) Also, we basically designed our whole kitchen around having a counter depth refrigerator. It was a must to increase traffic space, we picked a Summit, and I LOVE it! I love the shallowness of it, it's easy to see and reach in the back. The freezer section is on the bottom rather than the top, complete with ice maker. The freezer is teeny-tiny, but we have a chest freezer in the basement, so it wasn't an issue. I second everyone else who says less wasted food from not shoving it to the back. We have four children, and have no problem with space. The space is much more usable than our old fridge. It's super tall and skinny, and just looks nice. We also went with white IKEA cabinets, and I'm very happy with them. I made all the boxes, Hubby installed them. Very much a team effort and so worth the wait! (We went with white quartz from IKEA and the counters are probably my favorite part. Or maybe the pull out garbage. Or maybe the built in dishwasher . . . ;) Love what you have so far!!! Oh, sorry to hear that you wanted the integrated dishwasher. We knew it was getting discontinued awhile before it was, and after some research and discussion with a great IKEA kitchen lady, ended up buying the dishwasher 9 months early. So it didn't get the 20% off, but I'm glad we did it; it was my splurge, a matching dishwasher. There are other integrated dishwashers you can get though. Bosh has one, they are just more $$. I love the ceilings and the paint, but I especially love you keeping it real about your mistakes and your uncertainty. 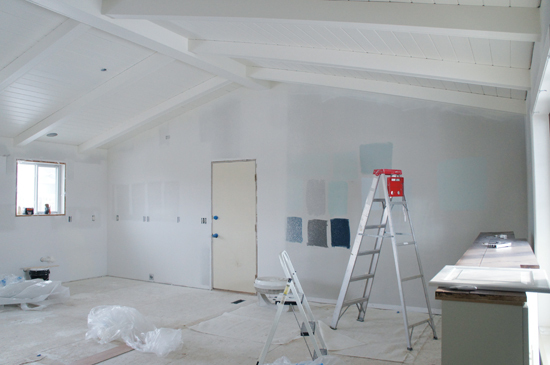 I have the hardest time with second guessing myself on paint colors--glad I'm not the only one! Beautiful! Can you tell me where you found the floral fabric for your shades? I am looking for something like this for counter stools. Thanks!! It would be lovely used on stools! Thank you so much for such a quick reply, I can't wait to get some for my home! Hi! I just wanted to let you know that I have Quiet Moments in my kitchen and living room combo and I love it! We have the preceding color Healing Aloe and the succeeding color Beach Glass in the house as well. We do see different shades throughout the day, but less so when the rugs and furniture came back in. I get so many compliments on the colors! You've done a wonderful job! It looks amazing! Hi Jen! I just have a quick question, are both the floral prints the same or are they different? if they are different, what are they both? Hi Layce! They are both the same, the image online looks a bit duller than in person (which I was totally OK with) xoxo! Hello! We thought the same, but we have read that floating floors can buckle if too much weight is applied, and cabinets should be installed first. So we are going with that, to avoid any damage to the new floors. xoxo! The kitchen looks so airy and bright, love it already. I have had a GE Monogram side-by-side counter depth fridge & freezer for several years; the only thing that truly is a tight fit is a large-size pizza box. I like having less space -- less depth has meant I can see everything without it getting lost in the back and less wastage. The drawers can fit a full head of lettuce or cabbage vertically, no problem. Milk drives our groc run frequency, every week to 10 days, so that means I dont need to "stockpile" fruits and vegetables beyond what we would consume in that duration. I would vote for the marble herringbone, it is classy and timeless and a perfect "blank" canvas to showcase bright colorful accessories. As home design trends evolve, there is the risk that the blue pattern might look dated. Love the ceiling, paint looks quite pretty. You have picked out some beautiful pieces and accessories, should look lovely when it's done. I particularly love the fabric choice! I am so impressed. I could never have the patience and physical stamina to take on such a project. Wow, that is one stunning ceiling! It's even better when you don't do it yourself and are always looking at the one spot that you know you slightly messed up on. I really do love the paint color. I know I'm just seeing it in pictures, but some of my favorite parts of my house I wasn't sure if I would like it at first glance. But the longer we have it, the more I love it. I hope it's the same with your paint. I am SWOONING over your ceilings. they look amazing! I love LOVE love them! Would you mind sharing the name/brand of the floral fabric in your mood board? (Next to the pic of the herringbone tile). Love the look you're going for! Those ceilings look GORGEOUS!! WOW!! LOVING the final look of them!!!! :) Thank you for sharing with us!! I am loving the progress!! Can you share the backsplash source? I have been searching for a couple years for a neutral herringbone to replace my impulse pick of colored glass mosaic that I do not love. I have a few samples but I don't like their sheen to go with our creamy/white quartz. PS. highly recommend quartz! 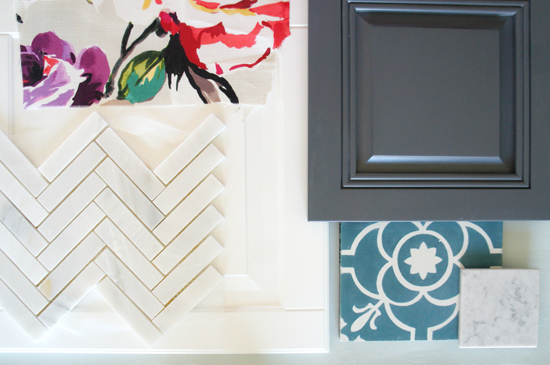 Hi Wendy - we picked up the herringbone backsplash at The Tile Shop, I believe it may be this one: http://www.tileshop.com/product/hampton+large+herringbone.do?sortby=ourPicks&refType=&from=Search xoxo! Everything looks terrific. Just a note about the floor/ cabinet installation. If you already haven't done so you might want to think about putting in a subflooring under the cabinets so they are at the same height as the flooring. This way when or if you ever have to move in the dishwasher, frig etc. you can do so. When we had our dishwasher replaced the installers were glad that the floor levels matched. They commented on how they have been in homes where they can't get the old appliances out because they are sitting lower than the kitchen floor. You have probably already thought of that though. Love you place. You're so brave! I swear, I would never have the guts to take on the tasks that you do! Especially with a husband and kids. I live in North Carolina, and I think you should get away from those harsh winters and move down South. Come wave your organizing wand over us! I painted over the dining stripes... But I still have stripes in the bathroom and our boy's room, and most likely will find a way to re-introduce them into our new living space when it is all said and done. I am a lover of stripes, that is for sure! xoxo! I can't wait to see the finished product. Looks Great just like all your other projects. Also, you have the cutest clothes. Can you do a post on where you get your outfits? love that necklace with the white shirt. Thanks. Love your blog!!!! Hi Jen! I'm a long-time fan of your blog and this is my first post. I love everything that you do, and by no means want to be a naysayer. But feel that I have to forewarn you about IKEA cabinets (probably too late). My in-laws put an entire kitchen of IKEA cabinets in their home 8 years ago. They looked great and were highly functional. By the time that we purchased their house from them last year, they were a wreck. Water damage, heat damage, warping. They are awful. I tell everyone that I hear even dreaming about a kitchen remodel to steer clear of IKEA. It would cost me 100s of dollars to replace the cabinet fronts, etc. to make them look good again. I'm going to wait a few years, throw them in the garbage and get quality cabinets. AND be sure to scan your receipt and save it, if you lose it they will not honor their guarantee and will not respond to you when you escalate for resolution, even when the product is clearly theirs. I do like IKEA and have many of their things but the cabinets are hands down the worst product of theirs that I have owned. Their customer service when resolving issues in the second worst!. Everything that you do turns out amazing, and I know this will too. I just don't want you to be as disappointed as my family has been as it is a huge investment to redo your kitchen. Hi Mary! Unfortunately, our cabinets are already purchased, and half installed as I type this. I am so incredibly sorry to read about your experience. I really hope that they have increased the quality since yours were initially purchased. I have heard so many great things about them from peers, and read review upon review. Yikes. I will definitely back up all receipts and purchase details as the cabinets we purchased did come with the 25 year warranty, but fingers crossed we won't need to use it. Again, so, so sorry to hear such sad news about your kitchen. I appreciate you stopping by with the warning. Amazing what you have done to transform the space. Love to see the vase filled with flowers in the mix...so you! I really like what you are doing to your home and thank you for sharing! I do have one comment. Perhaps now when you have the possibility you ought to think of adding some kind of half wall (1,5 to 2 meter high kind of thing) between the living room area and the entry door to be able to provide some hidden storage for jackets and shoes that end up in the entry way. This would also give you a wall in the living room part to make it easier to furnish. Love to see what you will do next! I love it!! I think it looks amazing!! We're currently trying to make all the decisions on our kitchen renovation, and we're probably going to use BM Simply White for the trim and ceiling. I'm trying to choose between Constellation and Glass Slipper for the walls. I had pinned Quiet Moments, so I am going to have to keep following around to see how yours comes together!! You should do the white herringbone under the cabinets and the bright blue over your stove (or vice versa). That white herringbone is too cute to pass up!!! We had IKEA install our kitchen and we did not have a counter deep refrigerator either but when I had the kitchen measured he measured so that they would make our fridge look built in, it was perfect. I absolutely love your blog - y'all are amazing and so inspirational! We're looking at IKEA cabinets now for our mudroom and I was wondering if you could tell me which ones you settled on? Thanks! Can't wait to see the finished product! Thank you so much! We went with IKEA's line from last year which was the Akurum, with the Lidingo White finish. I was just at IKEA and they have since switched over their entire cabinet system, and the new door fronts look fairly similar, but the colors are not the same. The Lidingo White is now more of an off-white... But they have other white options and even a pretty gray. :) Best of luck with your mudroom update! Hi, I've never commented before, I just admire from afar but...i thought I'd mention another paint color if you so desired to repaint(cringe). Ok, so it's SW Silver Strand and I think it's actually closely fits the paint color on your idea board. Worth checking out even if not for the kitchen. Best wishes. Thank you so much for the suggestion Adrianna! Funny thing is the color in my idea board is the actual color on my walls. Isn't it crazy how our space changes it? However, I posted another update today and the color was reading more true with my DSLR back in my hands. :) And it has really grown on me, so I think I may be able to avoid the repainting after-all (sigh). Thank you again! I am so sorry to hear you are already experiencing some cracking. I know first hand how frustrating that is, we have a few spots of that ourselves from past projects. For the ceiling, we went with GE Supreme Paintable Silicone: http://www.homedepot.com/p/GE-9-oz-Supreme-Paintable-White-Window-and-Door-Caulk-M90026-30/203370482. It was a little more expensive, and seemed to apply a little differently than others we had worked with in the past. We are hoping that it really holds up to the description. 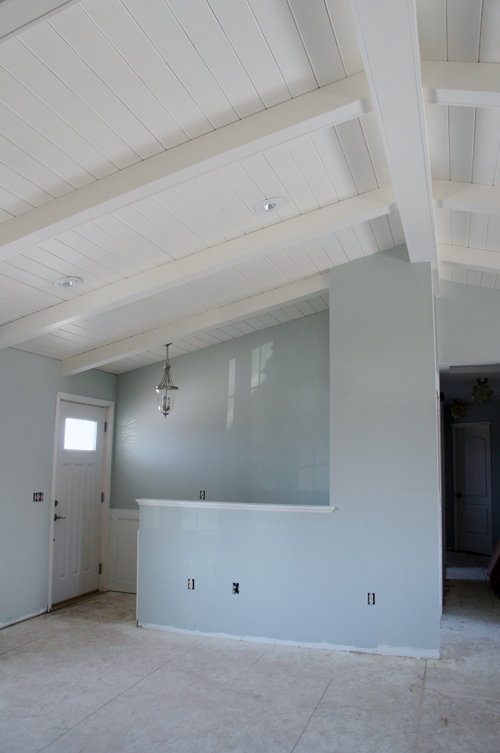 Did you paint the hallway the same color as the living room/ dining room or did you leave a grey? The hallway and down the stairs were both painted the same color as the rest of the living room and kitchen because there is not much of a start or stopping point to switch colors. 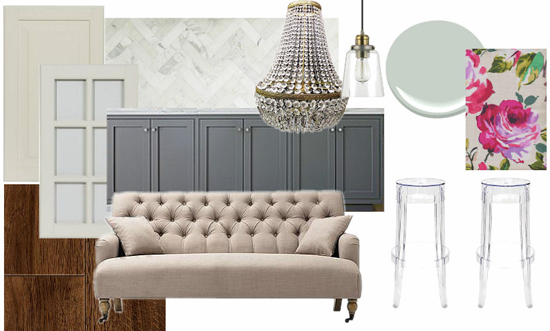 Did you color match the Benjamin Moore paint to Behr? I always seem to pick the wrong brand. I actually used Benjamin Moore for this painting project because I wanted to ensure quality coverage and be sure the color was spot on. However, I have color matched to Behr and Sherwin Williams in the past and have been pleased with both. I would rate BM and SW top and Behr third for coverage and quality, however, I recently gave the new Marquee Interior by Behr a try and was pretty impressed. xoxo!